For details regarding these services, please visit www.larsonwealthmgt.com, or contact us below to request further information. Securities and Financial Planning offered through LPL Financial, a Registered Investment Advisor, Member FINRA/SIPC. Insurance products offered through LPL Financial or its licensed affiliates. Blue Ridge Bank and Larson Wealth Management are not registered broker/dealers and are not affiliated with LPL Financial. For current LPL customers, please click the LPL Financial button below to login to your account. 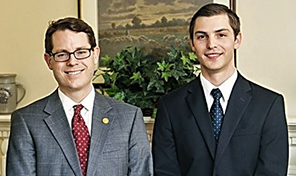 We are an independent financial services and wealth management firm located in Harrisonburg, VA and serving the Shenandoah Valley. We serve our clients through an academic and thoughtful approach to wealth management as we help "pilot" your financial plan throughout your lifetime and to the next generation. Together, we will make decisions using our experience, academic research, thoughtful questions, and enabling technology. We believe that the key to any well-executed financial plan is to spend our time and energy focusing on what we can manage, rather than worry about all of the things that we cannot. All too often, investors make decisions based on guesswork and prediction, rather than academic research. We focus on what we can manage: overall portfolio risk, diversification, expenses, and taxes, and strive to provide a better investment experience for our clients. We also believe that there is a direct correlation between risk and expected return. If one hopes to pursue a return greater than inflation, then one must be prepared to take an equivalent amount of risk. Our mission is to ask the right questions to discover the most appropriate investment allocation for you and your family. Each new client meeting begins with an open-ended discussion to better understand the challenges and opportunities that may lie ahead in your financial planning. We take the time to get to know you and your unique circumstances by asking pertinent questions and gathering quantifiable data. Together, we then discuss expectations and strategies for the best path forward. We offer a complimentary initial meeting. After the initial meeting, we work to firm up all of the financial information and create a list of planning considerations. We then work together to prioritize this list and begin making decisions as appropriate. Often times, by request, we schedule meetings or conference calls with your CPA, attorney, or other trusted advisors. We then carefully implement the plan and then monitor it and make changes as needed. After the plan is complete we decide how often we need to meet going forward, keeping an eye on the big picture, while working to maintain the right allocation, striving to minimize taxes, and discussing new opportunities as they arise. Securities and advisory services offered through LPL Financial, a registered investment advisor, Member FINRA/SIPC. LPL Financial and the bank are not affiliated. Products and services made available through LPL Financial are not insured by the FDIC or any other agency of the United States and are not deposits or obligations of nor guaranteed or insured by any bank or bank affiliate. These products are subject to investment risk, including the possible loss of value.